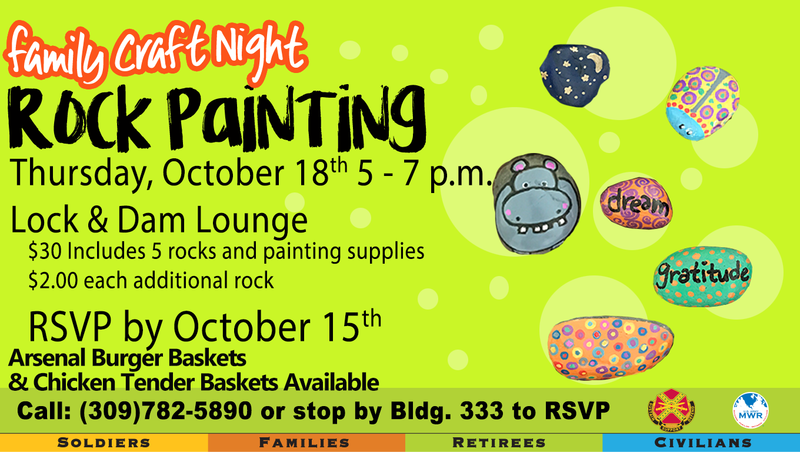 Date: Oct 18 2018, 5 p.m. - 7 p.m.
Bring the whole family and join us at the Lock & Dam Lounge for a fun evening of rock painting! Cost is $30 which includes 5 rocks and painting supplies which can be shared by as many family members as you'd like, additional rocks are $2 each. The Lock & Dam Lounge will be serving Arsenal Burger Baskets and Chicken Tender Baskets so make sure to come hungry. Please RSVP by October 15 by calling +1 (309) 782-5890 or RSVP in person at the Leisure Travel Office in Bldg. 333.